When using a rifle, or any firearm to be exact, vision is key. Not having a clear idea of what’s up ahead compromises everything about using the firearm, and nobody wants that. People who want to use a rifle or shotgun for any serious purpose will make sure to pick an effective scope that helps them make use of the firearm accordingly. Selecting a proper scope is best done according to a rigid set of criteria. Does it mount properly? Does its lens have any options that allow you to tweak its use? Some scopes make use of battery power for certain functions too so that should also be something you look at. Great all-around use. For its part the The AimPoint PRO Patrol Rifle Optic manages to do a little of everything very well. As an AimPoint red dot, it represents the brand very well. The optic itself gives you a wide range of levels, which is certainly appreciated. It works very well with an AR-15, which is no surprise since it is optimized for use with M4 and AR-15-types. What’s more, it will also work well with the SIG 516. On the whole, it can be very satisfying to use. The clarity of the glass is one of its strongest points, and since its frame is similar to the M2 and M3, mounts and other items that match up to them will work well with this too. Secure attachment. It attaches securely with a torque-limiting twist knob. The best level of tightness is at three clicks of the knob, because this give you a secure lock without risking damaging the rail. The mount doesn’t shift when you use it either, which tells you that this is fairly secure. Additional spacer for customizable height. The removable spacer is also a nice touch, because while using it puts the mount at the perfect height not everyone might be a fan. There are a lot of other scopes that feel like they sit too low and need an extra riser, but this sits comfortably with your eye, and this is a big deal for optimum firearm performance. No-frills packaging. Unboxing this is kind of funny since it’s just a plain box with some foam in it, nothing special. We had to read around to find out this was because the AimPoint PRO was originally designed for police department use. It’s austere but gets the job done, as you might expect. Makes sense, since simplified packaging also keeps the price down and doesn’t leave you stuck with some elaborate clamshell that doesn’t serve any actual purpose. You do get a free allen wrench and 1/3N-Cell battery, and some screws for using the scope minus the spacer. Unbelievably battery life! You’re going to love the battery life on this thing. The battery on the PRO is rated at around 30 thousand hours at even its brightest setting, which is amazing and well worth the price. Competitors like the Strikefire, which aren’t even as bright as the PRO, have a battery rating of 130 hours or so. There’s just no comparison. What other units will you use for around 3 years on one battery? This might be the best AimPoint optic you can get, as far as getting more than what you paid for. It stands head and shoulders above other scopes in terms of battery life, which is something you don’t think you need until you need it. 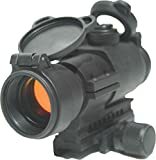 Overall, the AimPoint PRO is a well-priced fast-action optic that is good for all-around use if you can compensate for the problems with manipulating the knob.